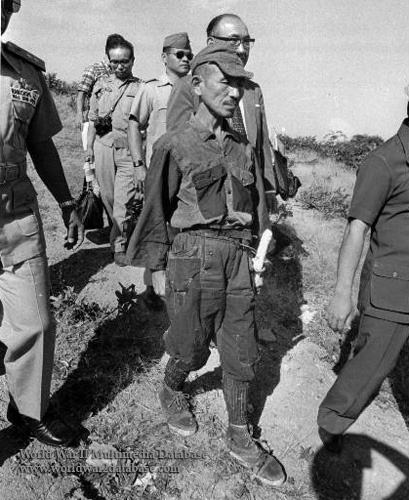 Imperial Japanese Lieutenant Hiroo Onoda walks to a helicopter in Brol, Lubang, Philippines for a flight to Manila. After expensive and widely reported searches by the Japanese Ministry of Health and Welfare involving aircraft dropping messages from his family, college dropout Norio Suzuki camped out for four days under a Japanese flag and communicated with Onoda on February 20, 1974, returning with his former commanding officer, Yoshimi Taniguchi, who ordered Onoda to surrender, reading him the Imperial order of September 1945. They were received by Philippines President Ferdinand Marcos in Manila on March 10, where Onoda formally surrendered. He was surprised when his offer of his sword was declined. Onoda had hundreds of rounds of rifle ammunition and grenades at the time of his surrender. One of his comrades surrendered in 1951, one was killed in a shootout with Filipino police in 1954, and the third was killed in 1972. The holdout Japanese unit killed 30 Filipinos and injured 100 others during the 29 years they were hiding on Lubang. During a visit in 1996, Onoda's return was protested by locals who had lost loved ones, while Onoda was hailed as a hero in Japan. He retired to Brazil to run a cattle ranch, but returned to Japan where he advocated for right-wing causes.